Two extremely dumb things happened to me this month. One Saturday, I woke up early to get to a scrapbook crop to meet friends, but needed to do some errands first. I drove down the street, turned the corner and saw a yard sale on the right side of the road, which reminded me I’d planned to go to one on the street behind my house. So, I did a quick U-turn in the intersecting road. Unfortunately, there was a wide sewer drain in the curb, and, as luck would have it, my tire struck it — making a loud, grating noise — before completing the turn. I tried to back up, but the car wouldn’t move at all. 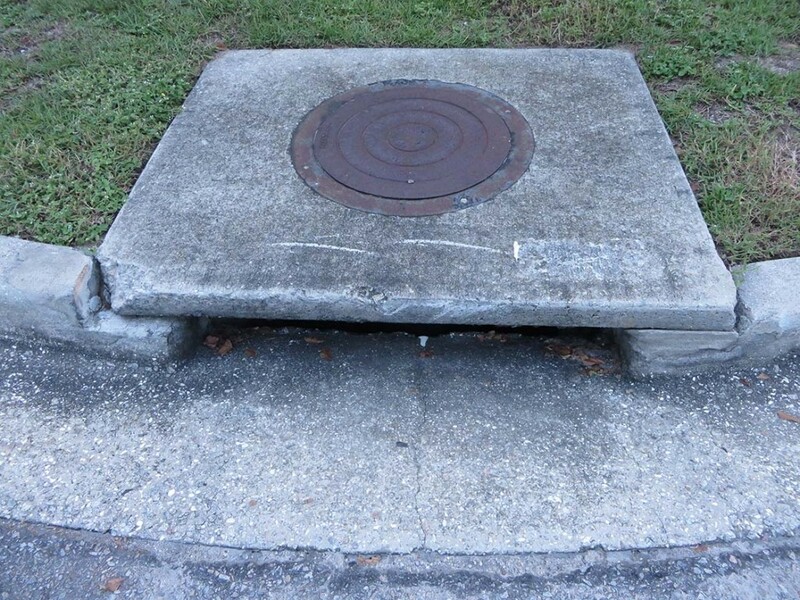 When I got out to look, I saw that the tire was wedged in the sewer drain sideways, parallel to the curb. Thoughts raced through my head about how embarrassing and time-consuming it would be to call AAA. So I decided to walk over to the yard sale across the street (I’d seen a man there) and ask meekly if he could help me. Two young men followed me over to my car — and I could see them rolling their eyes at each other. The hubcab in the middle of the tire is all scratched and actually chipping off at the edge (it looks like metal, but it’s obviously plastic). 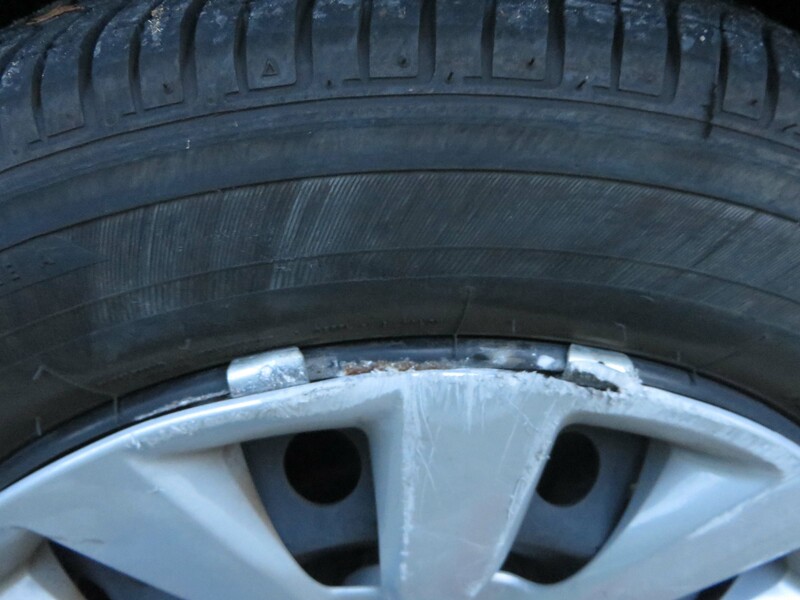 The tire is scratched, too — a very visible reminder of an incredibly embarrassing incident. About two weeks later, I was at work on a busy day and took a break to go to the restroom. I went into the cafe to get a Diet Coke after that. A man I know came up and made small talk for a minute while I was filling my cup, and then said, “Someone is going to tell you this. Your dress is stuck.” Then he pointed to the back of my longish, flowing dress. I quickly put up my hand to feel the back of the dress, and realized the hem was caught in the top of my underwear and pantyhose. I’d walked down a long hallway and through the busy cafe with my underpants showing. I’ve read about women getting their skirt stuck like this, but never thought it would happen to me. This entry was posted in embarrassing stories and tagged car stuck in sewer, dress caught in underwear, embarrassing mistakes, embarrassing stories, mistakes, skirt caught in underwear, stupid stories. Bookmark the permalink. Those pics are hilarious! You need another vacation! I have had the tire mistake in the past. Not a good feeling. Betty recently posted…Is Your Child Terrorized by Bus Bullies? Yes, it is. I had a short half slip on, but I guess it just got grabbed up, too. 🙁 Glad to hear that happened to someone else, too! Thanks for commenting.